I’m taking a few weeks off from the blog to spend some time with our little man and learn how to survive on 3 hours of sleep and baby giggles. While I’m away, some generous friends have offered to share their mad blogging skills here on NeighborFood. Today, I’m excited to introduce you to Ala of Wallflour Girl. Ala’s blog is a pool of sunshine. She’s one of my favorite storytellers, and I always leave her blog with a smile on my face. 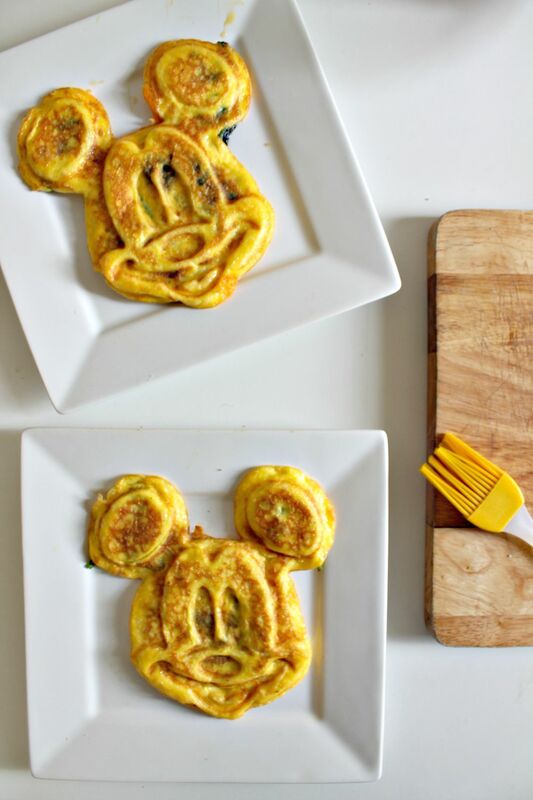 Case in point: these ridiculously fun Mickey Mouse Omelets you can make in your waffle iron! Mickey Mouse was such a big part of my childhood, I honestly couldn’t imagine growing up without him and the rest of the Disney crew. That’s why, when Courtney asked if I would guest post on her blog during this exciting time with her little one, I knew exactly what recipe I wanted to share. Because let’s be honest: is there anything more emblematic of childhood happiness than this little round-eared, adorable mouse? When I was little, on those rare occasions when we would sit down to eat an American-style weekend brunch, my mom would draw little ketchup smiley faces on our eggs before handing them over to us. There’s something about seeing silly smiles on your food that makes it infinitely better to eat, right? 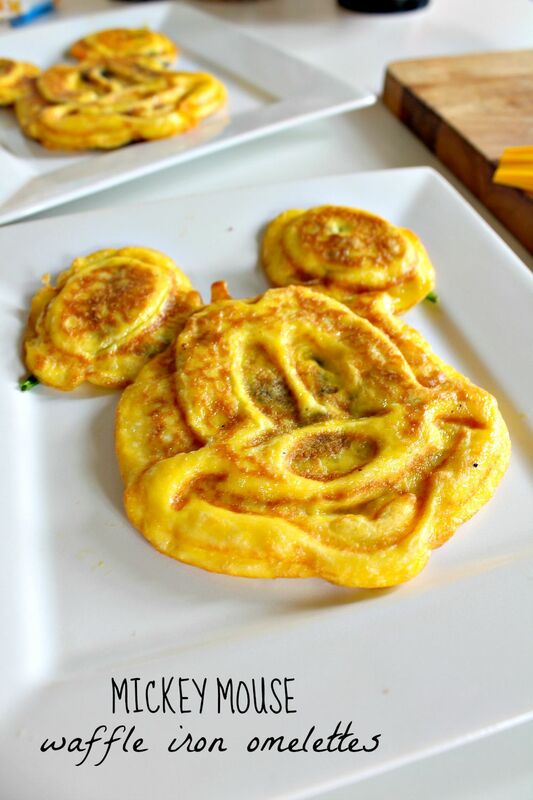 Case in point: I was grinning from ear to mouse ear when these Mickey Mouse omelettes came out perfectly. And who wouldn’t? Of course, you can make these in a regular waffle iron and draw your own funny faces on it with ketchup! Hope your day’s as bright a one as these smiley little bites! Preheat waffle iron. Heat oil in a pan over medium heat, then add onion and bell pepper. Saute for a few minutes, then add tomato and continue cooking vegetables until tender and lightly browned. Remove from heat. Add sugar (if using) to lightly beaten eggs, then pour half of your egg mixture into the waffle iron (or until it is just barely filled, as you would with waffle batter). Sprinkle with sauteed onions, bell peppers, and tomatoes (about half of the vegetables, using more or less as needed). Add half of the cheese, as well as salt and pepper to taste. Close lid on waffle iron and cook until your light indicates that your omelette is done. Pop out the omelette and enjoy! Green Eggs and (Veg)Ham–Celebrating Dr. Seuss! I love reading Ala’s blog and I agree – she is a good storyteller and brightens up my day with her stories. And this omelets? I need to try one asap. So cute! Any child would recognize the iconic character 🙂 Have fun with your time off! Yay thanks for having me over here to share, lovely lady! Hope these sleepless and baby-filled days are treating you wonderfully. Omelette in a waffle iron?! I have GOT TO try this! I’m also going on a hunt for a mickey mouse waffle iron. SO CUTE! OMG THIS IS THE BEST IDEA EVER! Soooo cute! These are SO CUTE!! And such a perfect idea! So smart!! !